What is it like to work in the creative industry? It's really hard being the "idea person" sometimes. This video illustrates what it's like to walk that line between creativity, relationships, the pursuit of financial profit, and the many directions you can intentionally or unintentionally find yourself taking. Wonderland | A Short Form Doc on Creative Commerce from Eskimo on Vimeo. Juan Gabriel Vásquez has been hailed not only as one of South America’s greatest literary stars, but also as one of the most acclaimed writers of his generation. In this gorgeously wrought, award-winning novel, Vásquez confronts the history of his home country, Colombia. In the city of Bogotá, Antonio Yammara reads an article about a hippo that had escaped from a derelict zoo once owned by legendary Colombian drug kingpin Pablo Escobar. The article transports Antonio back to when the war between Escobar’s Medellín cartel and government forces played out violently in Colombia’s streets and in the skies above. 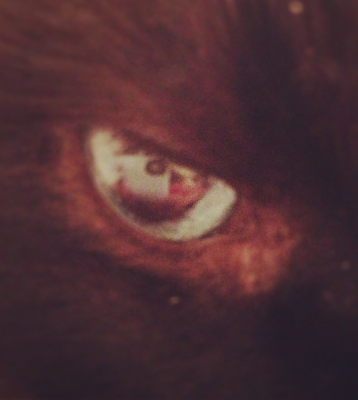 Back then, Antonio witnessed a friend’s murder, an event that haunts him still. As he investigates, he discovers the many ways in which his own life and his friend’s family have been shaped by his country’s recent violent past. His journey leads him all the way back to the 1960s and a world on the brink of change: a time before narco-trafficking trapped a whole generation in a living nightmare. 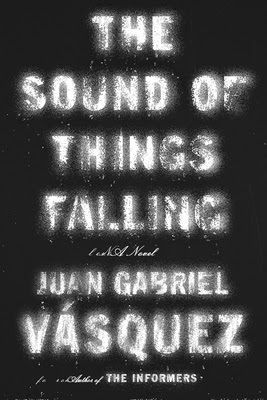 Vásquez is “one of the most original new voices of Latin American literature,” according to Nobel Prize winner Mario Vargas Llosa, and The Sound of Things Falling is his most personal, most contemporary novel to date, a masterpiece that takes his writing—and will take his literary star—even higher. Juan Gabriel Vásquez is a critically acclaimed Colombian writer, translator, and award-winning author of a collection of stories Los amantes de Todos los Santos, as well as the novels Historia secreta de Costaguana and The Informers, which has been translated into seven languages. He has translated works by Victor Hugo, E.M Foster and John Hersey, among others, his essay “El arte de la distorsión” won the Premio Nacional Simón Bolívar, and he is a regular columnist for El Espectador, the newspaper of dissent in Bogotá. Educated in Colombia, and in Paris at the Sorbonne, he now lives and teaches in Barcelona, Spain with his wife and twin daughters. You may recall I've posted in the past about my Urban Organics organic produce, my new slow food health kick and a call for healthier alternatives to traditional favorites. Yesterday, I had planned on using some of the GOYA® Puff Pastry Dough for Turnovers I had bought to test out so I took them out and put this dish together. It was so delicious, I think you should try it. I started off by heating up a Dutch Oven pot or olla and adding a teeny bit of olive oil, once I got that hot I added the turkey meat, sofrito, garlic and chopped onion. I seared the meat on one side and mashed it with a fork to separate it and spread out. Next I added the seasoning, this seasoning has replaced my store-bought Adobo and Sazon and is a good alternative to those if you don't DIY. I also added a 1/2 tsp of turmeric, cumin, basil and paprika in addition to the seasoning. I covered the meat with a lid to get a thorough cook and chopped and soaked the rainbow chard to get all the soil and sand out. Then I threw that into the pot and cooked it down for about 10 minutes, stirring it about 1x. When the meat looked pretty done, I added 3/4 of a jar of marinara sauce, put the heat on low, and let it simmer for about 40 minutes covered. I actually left this on the stove for about 1.5 hrs while I washed my hair and relaxed. Then I came back and took out 2 muffin tins, which I lightly sprayed with cooking spray. I inserted one piece of puff pastry into each opening making a little open pocket and cupping them as necessary. Into each I added about 1 large tablespoon of the meat mixture and then grated fresh parmesan over them. Once I was finished I wet a paper towel with a bit of olive oil and dabbed the portruding ends of the dough to get them to crisp and brown. I cooked these in a pre-heated oven at 350 degrees for 25 minutes. They browned beautifully and the meat was really tasty and tender. My boyfriend added hot sauce and sour cream to his and couldn't stop himself from literally eating about half a dozen - that's how good they were. I would love to find some whole wheat pastry and some organic marina sauce - next time I am in Trader's Joes, I will have to remember this, if you know of any, let me know. Also if you have left over chili or meatloaf you can easily turn it into another dish by simply filling the pastries in. Next time, I am going to try using some canned salmon. With "smart immigration" still in the headlines, the Ewing Marion Kauffman Foundation is offering a free ebook to help more people understand the issues related to immigrant entrepreneurs and how current policies affect this important economic force in America. 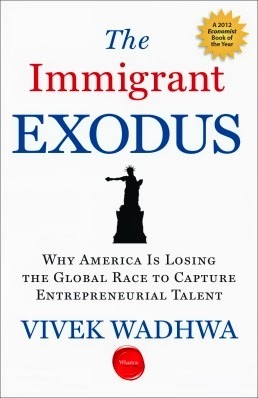 In his pivotal book, The Immigrant Exodus: Why America Is Losing the Global Race to Capture Entrepreneurial Talent, Vivek Wadhwa, a leading scholar and public voice on entrepreneurship and public policy, draws on fifty years of research and his Kauffman Foundation report, "America's New Immigrant Entrepreneurs - Then and Now," to show that growth in immigrant entrepreneurship in the United States has peaked, is stagnating, and is on the verge of decline. This looming decline is historically unprecedented, and has huge implications for the already-ailing U.S. economy. By Margaret Roach, a couple of years back when I still worked as an online book publicist at Hachette Book Group. I was enamored instantly at the courage of the author, who left a 15-year career at Martha Stewart Living Omnimedia, where she reigned as Editorial Director, and moved into her weekend Upstate house to be closer to nature and lead an authentic life. There is a certain glamour that comes with the fast-pace of New York City albeit the grittiness and rat race feel of it all. The deeper one is entrenched in the every-day monotony, the more you yearn for simplicity, frankness, and an uncharted course. Of course, this may just be symptomatic of "the grass is always greener" or wanting what you don't have - which is simply human nature. Of course, the girl with curly hair envies the stick-straight locks of a friend or the successful high-wheeling executive wants to ditch it all and go surfing, it all makes perfect sense. I've had so many conversations with so many friends who just don't want to work any more that I wonder if we've all been hoodwinked into this narrow path of college and making lots of money and moving up the corporate ladder qualifying as success. Perhaps that unfulfilled feeling points directly to something we are missing - that which cannot be satiated with a pair of designer shoes or organic, fair trade coffee beans. The Atlantic published a piece on the trendiness of "Farm Lit" several weeks ago: "chick lit is dead (or dying, at least). But in its place, we now have a new genre. Call it "farm lit." In farm lit books, our heroines ditch the big cities beloved in chick lit—New York, Chicago, LA—in favor of slower, more rural existences, scrappily learning to raise goats on idyllic Vermont farms or healing their broken hearts by opening cupcake bakeries in their sweet Southern hometowns. Instead of sipping $16 appletinis with the girls, they're mucking out barns and learning to knit. Instead of pining after Mr. Big, they're falling for the hunky farmer next door." The irony here is from the "first world problems" lens. These are the frustrations and complaints that are only experienced by privileged individuals in wealthy countries. I think back to another favorite, If I Bring You Roses By Marisel Vera, that speaks to another era, a simpler one in rural Puerto Rico and I think about my grandmother or migrant farm and day laborers - about working with your hands and the soil, what would they make of this "trend." against the stubble of my harvesting. Sweeter than the oats or wheat or corn. It will not bring me knowledge of my hunger. 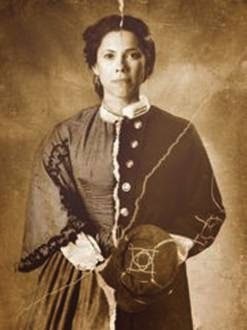 Rebel, a new documentary explores the Secret Life of Loreta Velazquez -- Cuban immigrant, Confederate Soldier turned Union Spy. REBEL will premiere in New York on WNET on Sunday, July 21 at 7PM or you can watch the full length film here. REBEL is based on Loreta’s 600-page memoir, A Woman In Battle, which caused a sensation when it was published in 1876 and remains in print to this day. For over a century, Loreta was dismissed as a liar and a prostitute, but new evidence indicates she was no hoax. 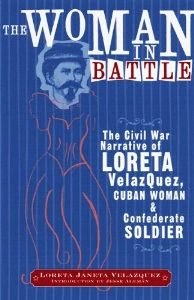 “Loreta’s memoir gives us rare insight into war from a woman and a Latina’s point of view. She was an immigrant serving her country by fighting for it, as so many generations have done. Growing up in New Orleans she naturally aligned herself with the South and even kept a slave, but records show she would end up spying for the North. She was a complex woman who ultimately turned against war as a solution to the world’s problems,” says writer/director María Agui Carter. Although Loreta’s memoir, which most historians acknowledge to be somewhat embellished, was dismissed as a hoax for over a century, historians have recently discovered documents in the National Archives as well as newspaper articles and letters proving that she did indeed exist. “Loreta Velazquez was a rebel who flouted all the rules to become a part of American history,” says Ms. Agui Carter. LATINO AMERICANS is a landmark six-hour documentary featuring interviews with nearly 100 Latinos and more than 500 years of History, narrated by actor Benjamin Bratt, will air nationally on PBS on three consecutive Tuesdays, premiering on September 17, September 24 and October 1. Become a part of the LATINO AMERICANS project. Make a video describing what being Latino means to you, share your family traditions, tell us how you celebrate your heritage and culture or let us know about your role models. Share your story and become part of #LatinosPBS. Watch Episode 3: War and Peace Trailer on PBS. See more from Latino Americans. Watch Episode 4: The New Latinos Trailer on PBS. See more from Latino Americans. Watch Episode 6: Peril and Promise Trailer on PBS. See more from Latino Americans.